Owen Jacob Hinshaw1,2,5,7,8,9 [O.J. Hinshaw2]. Hinshaw, Owen J., son, age 20, born in Iowa; parents born in Iowa; first marriage, married 8 months; occupation: farmer, general farm. Hinshaw, Ethyl M., daughter-in-law, age 20, born in Iowa; parents born in Iowa; first marriage, married 8 months. Hinshaw, Owen J., head-of-household, age 29, born in Iowa; parents born in Iowa; rented home; occupation: farmer, general farm. Hinshaw, Ethyl, wife, age 29 [unclear], born in Iowa; parents born in Iowa; first married at age 20. Hinshaw, Allen W., son, age 9, born in Iowa; parents born in Iowa; attended school. Hinshaw, Chester E., son, age 7, born in Iowa; parents born in Iowa; attended school. Hinshaw, Mildred M., daughter, age 5 [unclear], born in Iowa; parents born in Iowa. Hinshaw, Owen J., head-of-household, age 40, born in Iowa; parents born in Iowa; first married at age 20; owned home; radio in home; occupation: farmer, general; not a war veteran. Hinshaw, Ethyl M., wife, age 40, born in Iowa; parents born in Iowa; first married at age 20. Hinshaw, William A., son, age 19, born in Iowa; parents born in Iowa; occupation: laborer, farm. Hinshaw, Chester E., son, age 18, born in Iowa; parents born in Iowa; attended school. 1920 census, Harrison Township, Mahaska County, Iowa; roll T625-501, ED 71, page 4B, line #88, dwelling #90, family #90. 1930 census, Gridley Township, Butte County, California; roll T626-113, ED 24, page 3A, line #23, dwelling #64, family #65. Contribution from Anne (Hegy) Reaves (). 1900 census, Cedar Township, Lee County, Iowa; roll T623-442, ED 55, page 6A, line #21, dwelling #107, family #107. 1910 census, Harrison Township, Mahaska County, Iowa; roll T624-412, ED 68, page 247B, line #68, dwelling #64, family #64. Owen Jacob Hinshaw's driver's license. 1900 census, Harrison Township, Mahaska County, Iowa; roll T623-446, ED 62, page 30A, line #14, dwelling #628, family #639. 1910 census, Harrison Township, Mahaska County, Iowa; roll T624-412, ED 68, page 247B, line #63, dwelling #63, family #63. 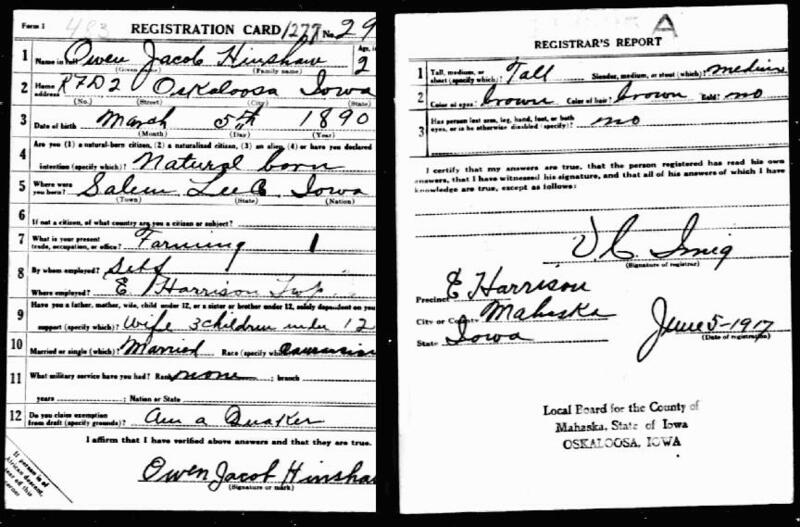 1920 census, Harrison Township, Mahaska County, Iowa; roll T625-501, ED 71, page 4B, line #93, dwelling #91, family #91. 1920 census, Harrison Township, Mahaska County, Iowa; roll T625-501, ED 71, page 4B, line #97, dwelling #92, family #92. 1930 census, Gridley Township, Butte County, California; roll T626-113, ED 24, page 3A, line #31, dwelling #66, family #67. 1930 census, Gridley Township, Butte County, California; roll T626-113, ED 24, page 3A, line #15, dwelling #61, family #62. 1930 census, Gridley Township, Butte County, California; roll T626-113, ED 24, page 3A, line #13, dwelling #60, family #61.